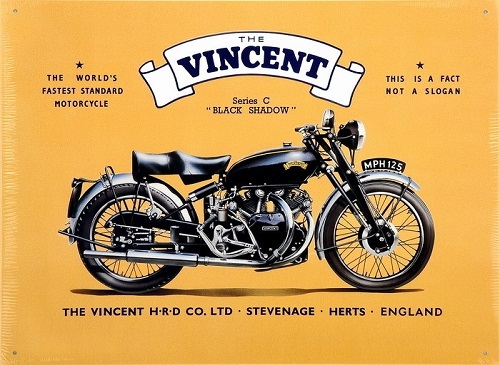 Yes, any 1,000cc motorcycle today can hit 150 mph, but the Vincent Black Shadow was doing that sixty years ago. It was an incredible machine, conceived and designed to out-handle, out-accelerate, and out-brake every other motorcycle of its time. Upon graduating college with an engineering degree in 1928, Philip Vincent bought the rights to the troubled H.R.D. (Howard R. Davies) Motorcycle Company, adopting the name Vincent-HRD. His first bikes used British JAP engines in his original frame design, which featured a patented cantilever rear suspension. In 1931, Australian-born Phil Irving joined the company, and as chief engineer, began designing engines with Vincent. After several successful 500cc single cylinder bikes, their first V-twin motorcycle was the Series A Rapide, introduced in October of 1936. An under-square 84mm x 90mm bore and stroke displaced 998cc. Cylinders were set 47.5 degrees apart, compression at 6.8:1. A separate, four-speed gearbox sat behind the engine. Shortly after the second World-War, the shorter, lighter, and faster Series B Rapide appeared. The cylinder angle was changed to 50 degrees. The motor now hung suspended from above as an integral part of the frame, with the front and rear suspension attached to it. A triangulated 6-pint oil tank connected to the top of frame under the gas tank spine. The external 4-speed gearbox was replaced with a "unit" transmission (inside the engine cases). At 475 pounds, the Series B Rapide rolled on a 56" wheelbase and was capable of 110 mph. Front and rear wheels were detachable without tools, with the back fender hinged for easy access. The rear wheel wore sprockets on both sides to provide quick, alternate gearing. Stopping power was supplied by four brakes, two per wheel. Both brake and shift foot-pedals were adjustable. While other bike manufacturers were changing to hydraulic telescopic forks, both Vincent and Irving believed their girder forks, made from aircraft-quality alloy and hydraulically dampened, to be superior at high speeds. Decades ahead of its time, the Vincent's rear suspension was comprised of a triangular-shaped structure located under the seat. This pivoted rear fork assembly gave excellent high-speed dampening and predated the modern mono-shock by thirty years. 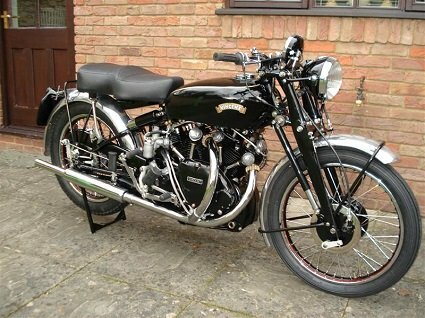 The Black Shadow motorcycle, introduced in 1948, was a faster, super-sports variant of the Rapide. The company's aim was to offer a bike that ran 125 mph without sacrificing low-speed driveability. Bright parts were mostly aluminum or stainless steel, and aluminum-alloy was used when and where it could save weight or make a part stronger. Increased power was accomplished through use of larger inlet ports, lighter and stronger connecting rods, and higher compression. Output was 54-horsepower at 5,700 rpm. A pair of Amal carburetors fed the two cylinders. 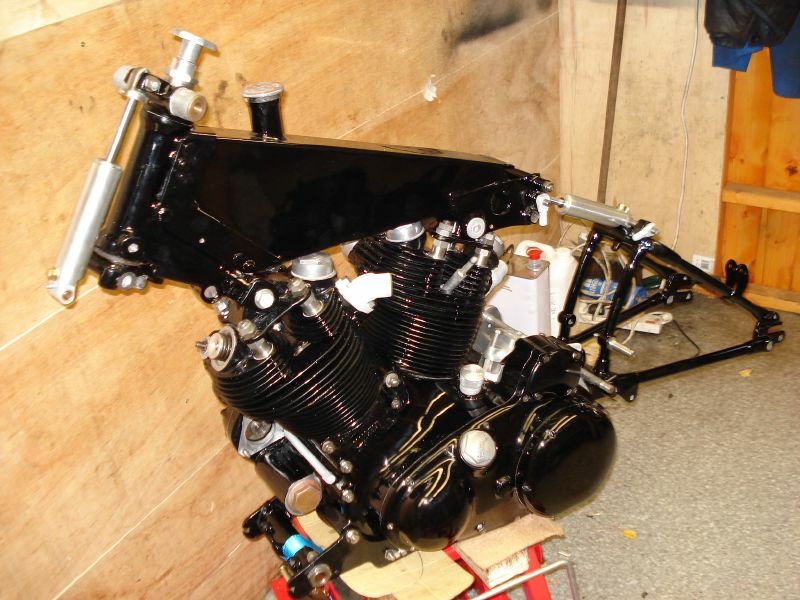 Cylinders, heads, crankcase cover, and side covers were black. A large, easy to read 150-mph speedometer sat upright in the middle of the handlebars. 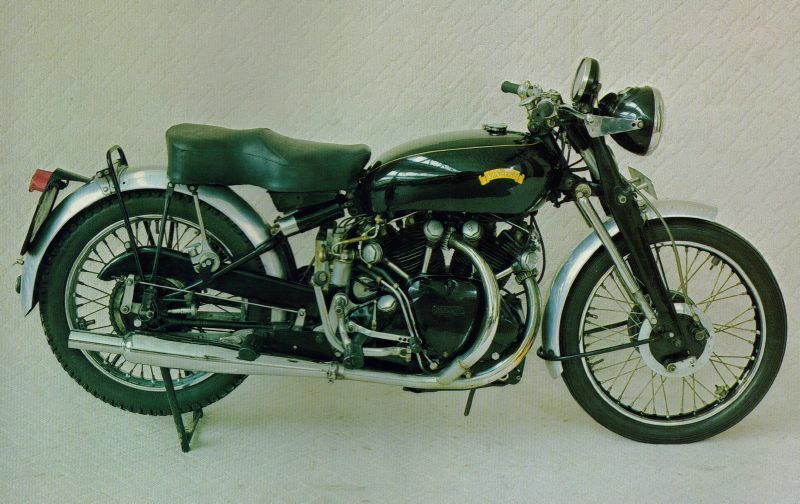 The Black Lightning was produced by Vincent as a race version of the Black Shadow motorcycle. Output was further increased with hotter cams, higher compression ratio, and larger carburetors. Non-essential parts were removed. Lighter-weight alloys replaced steel parts when possible. In 1948, a Black Lightning was brought to the Bonneville Salt Flats. The bike's seat, front fender and front brakes were removed to reduce weight. 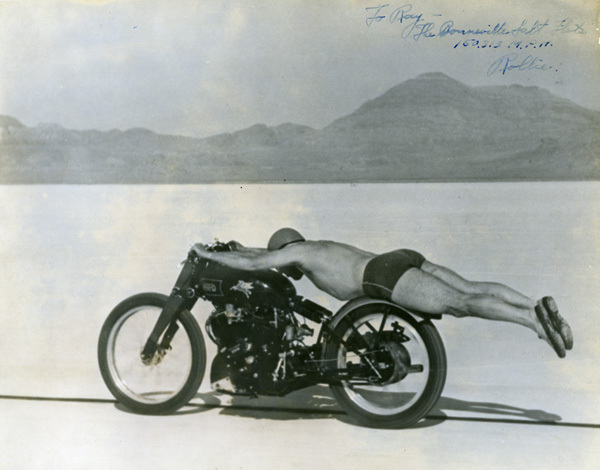 Stretched out flat on the rear fender, dressed only in a bathing suit and cap to reduce wind resistance, racer Rollie Free set a new world record of 150.313 mph. The old record of 136.183 mph was held by Joe Petrali riding a Harley-Davidson Knucklehead. 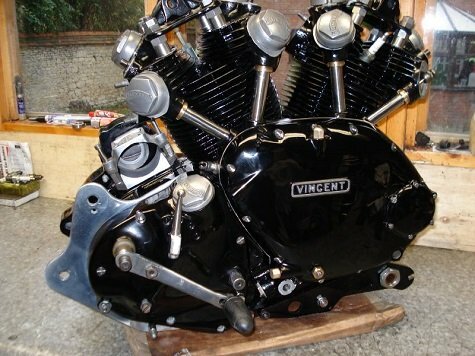 Nearly 12,000 Vincent V-twins were built after World-War-Two. Fewer than 1,700 Black Shadow motorcycles were built. 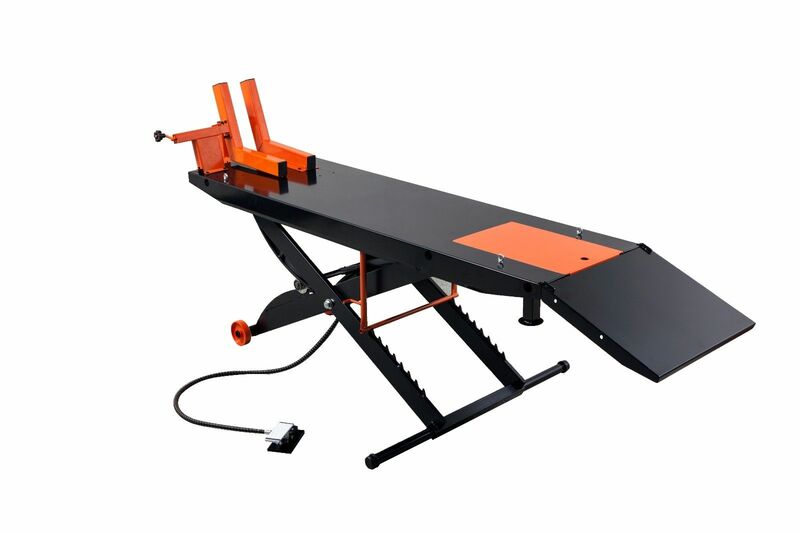 Each and every bike produced was hand-built and used the highest quality materials. Expensive to produce and not profitable to make in the quantities sold, Vincent Motorcycles ceased production in December of 1955. Without motorcycle production, several attempts were made to revive the company. Between 1955 and 1959, Vincent developed several new engines, including one for a lawn mower and several for the Amanda Water Scooter. The company finally fell into receivership in 1959. Since then, the name and motorcycle component manufacturing rights have been bought and sold several.